Two BAS students won the Dean's Award for Academic Excellence, which is awarded to students with the highest sessional grade-point average based on a course load of at least 30 credits in each of all four years in the Faculty of Liberal Arts and Professional Studies. The award for the First Year Students went to Shuman Zhang (Specialized Honours, BAS Finance) and the award for the Fourth Year Students went to Fransiscus Winson (Specialized Honours, BAS Accounting). 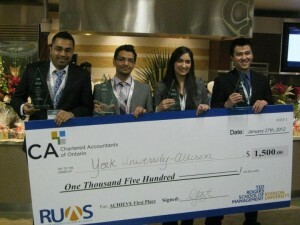 A team of Accounting Majors from York's School of Administrative Studies came in first place out of 11 teams at the 4th Annual ACHIEVE Accounting Conference & Case Competition, held January 26-28, 2012. The three-day event gave students an opportunity to demonstrate their skills in front of industry professionals as well as network with other accounting students. The participating students were tested on their knowledge of accounting concepts, while engaging with contemporary issues such as social media, social responsibility, and the global business environment. The team of BAS Accounting Majors at the School of Administrative Studies received a grand prize of $1,500 and a trophy. The winning team members (from left) are Naveed Khalid, Talwinder Singh, Seema Akram, and Jason Cai, all fourth-year students. Their professors and all of the SAS and York communities are proud of their accomplishment and offer their heartfelt congratulations to the winning team, and to all of the York students who participated in the event.